A weekly newspaper has successfully overturned a naming ban on a teenager who was convicted of the manslaughter of a father of two. 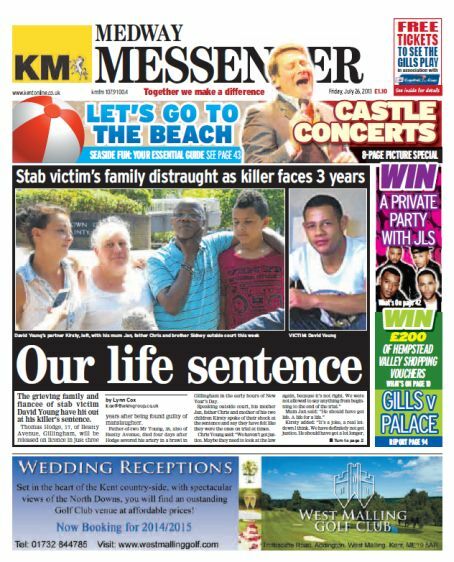 The Medway Messenger has been able to name 17-year-old Thomas Hodge after he was jailed for seven years for the manslaughter of David Young. Reporters from the paper submitted a letter to Judge Jeremy Carey requesting that a Section 39 order, which prevented his identification, be lifted due to the seriousness of the case. Drug addict Hodge was cleared of murder but convicted of manslaughter at Maidstone Crown Court this week over the death of Mr Young, who was stabbed as he walked home in Gillingham in the early hours of New Year’s Day. The request for the order to be lifted was the work of court reporter Keith Hunt and crime reporter Lynn Cox, who have both covered the case. Editor Bob Bounds said: “If we hadn’t made the application, maybe the judge wouldn’t have been inclined to lift the order. “The jury went out on Monday and as soon as the evidence was done, we put the letter in, arguing that he should be named because of the seriousness of the case. “We knew that he wasn’t far off his 18th birthday anyway, so it seemed crazy to allow him anonymity in such a serious case. The court was told that Hodge and another man, who was acquitted of all charges, had clashed with Mr Young in the early hours of New Year’s Day and it ended with him being stabbed in the left thigh. He died four days later at Medway Maritime Hospital. Hodge, of Beatty Avenue, Gillingham, was told that he would serve around about three years of the youth custody sentence before being released on licence. Very often we see the courts put outrageous orders on to protect criminals mainly because they don’t properly understand media law which is a constant annoyance. A sensible judge backing an editor and newspaper that is prepared to make the effort. I wish all judges would show such commonsense. Well done Bob, Keith and Lyn. Brilliant work again byChief Reporter, Keith Hunt who repeatedly crafts letters challenging orders!